Unicorn Gundam Waist and Arm Paper Model - 5X Bigger	. Some people like to build smaller paper craft to save money and storage space, but some people are just excited building bigger ones, larger the better. 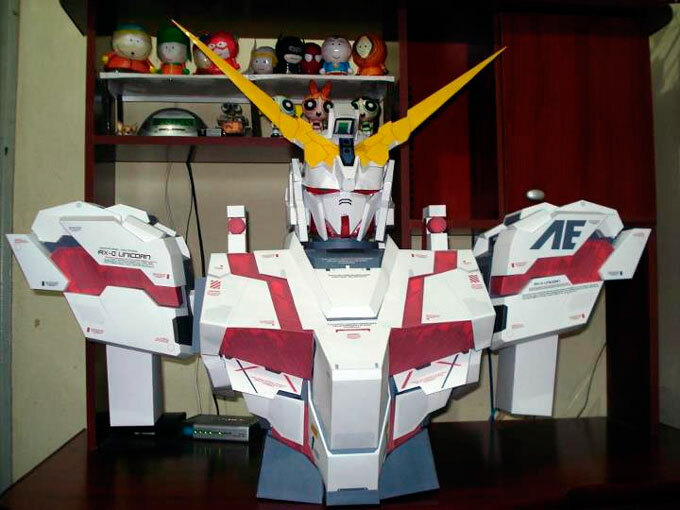 I never thought about this Unicorn Gundam when I made the template, it will be enlarged 5x like this. So better cut the intro, here they are more larger part for Unicorn's arm and waist-hip parts. The arm file was submitted by Thomas Septian Chrisnanda, and the other come from Nada Papercrafter. Also many have ask me about the strength of this 5x Unicorn, you have to layer all parts with corrugated paper boards, otherwise it won't be able to support its own weight. I don't have any waist part photo, but I have this photo below built by Renato Macedo to give you picture on how big it is, it will be 2 meters height when standing.